Well, would you look at that. Less than 24 hours after the Nexus 5 appeared on Google Play for a brief moment before being pulled, Google has sent out an invite to Geek.com for an event to be held at 7:00PM Eastern on October 24 in NYC. 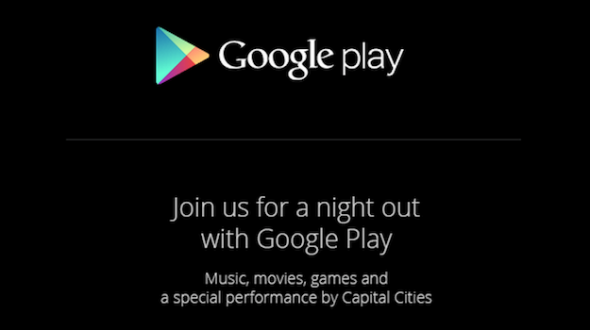 The invite shows “Google Play” in the top header, and then mentions joining them for a “night out with Google Play.” There will be music, movies, games, and a special performance by Capital Cities. So is this the Nexus 5 event we have all been waiting for? Tough to tell. Update: Geek.com is now reporting that this event will not feature new hardware. So no, this is not the Nexus 5 event. There is no mention of Android whatsoever, or devices or anything new. The invite also doesn’t appear to have been sent to any other tech media that we are aware of, so we’re not really sure what to think. With the end of October approaching, and rumored Nexus and Kit Kat launch dates coming and going, this seems like good timing for an unveiling. But something also just doesn’t seem right. No matter what, it has been marked on our calendars. You tell us – is this the big event?